There was a lovely story in the Bexley Times this week about a couple celebrating their 75th wedding anniversary. 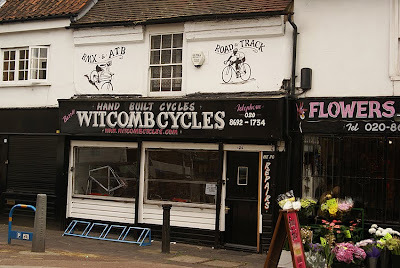 Lily Witcomb, 95, is married to Ernie, 91, owner of Witcomb Cycles. This cycling company has a long and distinguished history - much of it in Deptford. Although they moved to Wales in 2009, the company had for the previous 40 years made and sold its bicycles in Tanners Hill. It had been founded by Ernie in 1949, and at first he built the bikes in his back garden. The company grew steadily, and its racing bikes were used by among others Stan Brittain. He rode his Witcomb into 68th place in the 1958 Tour de France - one of the first British riders to finish the race. Witcomb even had their own racing team. Perhaps Lily's most literally visible contribution to their success was her choice of lilac as the company's racing colour. There was something of a decline in the 1980s, when mountain bikes became popular, but the firm continued to be one of the few remaining frame builders in London until last year. The brand should continue from its new Welsh home, but the Deptford connection now seems to be at an end. 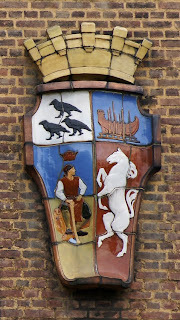 Thanks to Deptford Dame for introducing a new Deptford blog, the Shipwright's Palace. It explores the dockyard's history, as well as setting out a very worthwhile listing proposal for the King's Yard, established by Henry VIII on what is now the Convoy's Wharf site due for redevelopment. The remodelling of Margaret McMillan Park is underway, so it's a good time to remind ourselves of Margaret McMillan's local connections. Although born in New York and brought up in Scotland, she did some of her most important work here in SE8. Margaret and her sister Rachel McMillan worked with the poor children of Deptford, providing nurseries and night camps. They believed in the importance of fresh air and outdoor life, and they also provided opportunities for washing, clean clothes and medical attention. As well as the good they did for local children, the McMillans were also active in sharing their ideas and approaches: Transpontine has recently described the visit of Australian author Miles Franklin in 1916. She saw the nursery, then caring for the children of munitions workers, as 'a charmed land of infants and toddlers'. The sisters made a lasting mark on Deptford, not least in the various places commemorating them. Rachel's name predominates - after her sister's death in 1917, Margaret remembered her in the name of the nursery teaching college she founded. 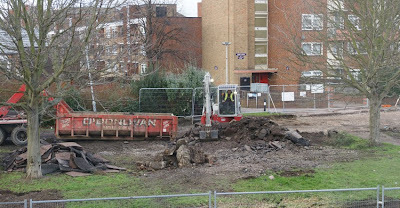 Now absorbed into Goldsmith's College, that site went on to be known as the Rachel McMillan halls of residence before becoming absorbed into the new McMillan Student Village. Nearby is the Rachel McMillan Nursery. It is good, then, that the balance is redressed by this park off Douglas Way: let's hope that once transformed, it's a worthy memorial to Margaret. It's well-known that the railways brought many changes to British life: standard time, seaside outings, railway architecture grand and humble. However, for one small Somerset community, there was another significant change: to the village's very name. South Brent sat at the foot of Brent Knoll, a distinctive hill familiar to anyone who's driven along the M5 south of Bristol. Long before the motorway arrived, though, the village temporarily doubled in size around 1840 as workers building the Bristol and Exeter Railway moved in. 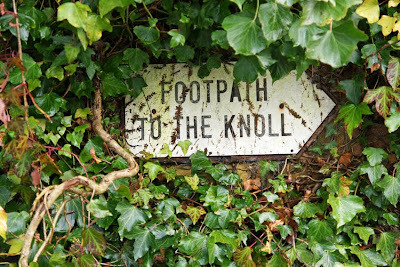 The line ran along the base of the hill, and after a station opened in 1875 the neighbouring village became Brent Knoll for the benefit of its passengers: they were not to confuse this Somerset South Brent with another in Devon. Today, Brent Knoll's railway station is gone (it closed in 1971). The altered village name, though, remains. On Monday last Captain Pierce, late Captain of His Majesties ship the Saphire, together with the Lieutenant, were according to the Sentence of the Court Marshal, executed on board the Dragon near Deptford. Isaac Schomberg's Naval Chronology of 1802 and a contemporary account quoted in the Naval Chronicle for 1809 give some more detail. The Sapphire (or Saphire) was near Sicily when four ships were sighted. Thinking that they were Turkish men of war, Captain John Pierce and Lieutenant Andrew Logan panicked and ordered the ship to run away from them. The crew - including the master and the purser - were unhappy at this: both they and the ship were ready for a fight. However, Pierce and Logan wouldn't let go the anchor and the ship continued on until it ran aground on the Sicilian coast. 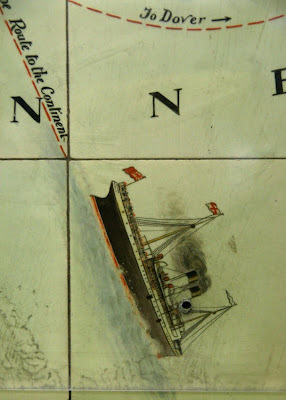 The ship was lost and Pierce and Logan were court-martialled on board the King's yacht, the Bezan, near Tower Wharf. 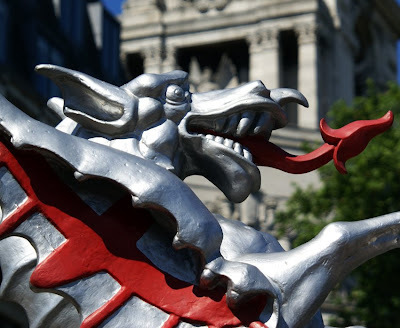 The court unanimously condemned the men to be shot on board one of the navy's ships, and the Dragon at Deptford was used for the purpose. 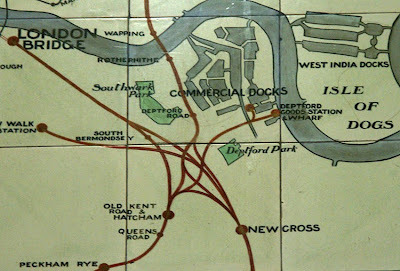 I can't resist one more detail from the maps at Victoria Station: this section showing the area around Deptford, including the now-lost branches serving the docks. There are plenty of things to complain about in Victoria Station, but a few real pleasures too. 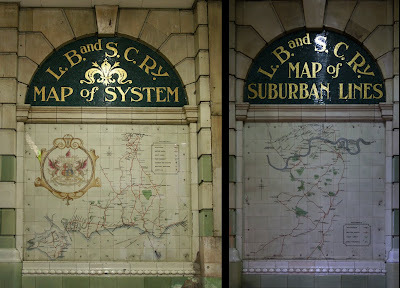 I love to look at these wonderful tile maps with their fine mosaic headings, showing the routes once served by the London Brighton & South Coast Railway. The 1700s were a period of great concern about property crime. Notoriously, the 'Bloody Code' of criminal law created hundreds of capital offences (some strangely specific, such as the damanging of a particular bridge). Despite this lavish threatening of the death penalty, the newspapers of the period are full of accounts of violent crimes: highwaymen and armed robbers run through their pages. Early on Friday morning four men armed, landed out of a boat at Deadman’s Wharf, Deptford, one was left to take care of the boat, another was set to watch in Grove-street, while the other two broke open a house in that street; they stript the lower part of it of the most valuable things, then attempted to go up stairs, but in forcing open the door to the stairs, a bell fixed to it rang, which alarmed the mistress of the house, and there being only a wainscot between that house and the next, she rapped against it, and the gentleman of that house called out to know if a fire was broke out; she replied, thieves; upon which he threw up the sash, and discharged a pistol at the fellow who stood at the door to watch, and, it is supposed wounded him, as he went off groaning; the report of the pistol brought the other two out of the house, who discharged each a pistol at the gentleman, but happily missed him. The gentlewoman of the house, which they had broke open, having a loaded gun in her chamber, seeing them fire at her neighbour, discharged the piece at them; but pointing too high, the shot went through the glass of a window of the opposite house, and was near wounding a young lady opening her shutters to see what was the matter. The thieves, however, made off with the goods they had got from the lower part of the house, went into the boat, and rowed away. When Women's Hour discussed this topic today, they were not talking about the workers of World War II, but of eighteenth-century women who ran ship-building businesses. They succeeded in a highly competitive business, supplying warships during the Napoleonic Wars. The stories of several of these women were told, including one from Deptford who inherited her husband's business in preference to their two sons. Listen to the feature here. The truth is hardly less impressive. 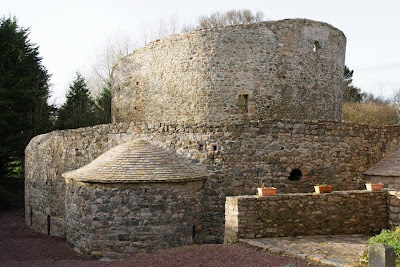 This romanesque temple was built in the eleventh century, and is modelled on the Church of the Holy Sepulchre in Jerusalem. 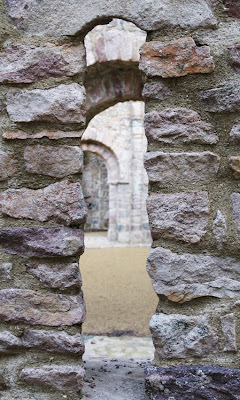 Dedicated to the Virgin Mary, it may have been built by the Knights Templar but there's no evidence to prove that (perhaps romantic) conjecture. The inspiration and funds might equally have come from wealthy pilgrims to the holy land, for example. 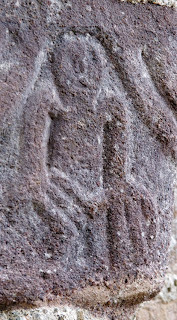 The temple is partly ruined - it was used as a source of stone for local buildings including the village church opposite. However, that only adds to its romance. Other secrets lurk here too. 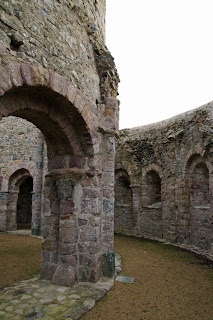 Two concentric circles form an ambulatory, with Roman arches and pillars. On the capitals of those pillars are carvings, now very worn. Some show fabulous beasts and perhaps strangest of all, people with strangely large hands. Clumsy carving, or something more meaningful? Everything's chaotic at the moment, so posting is going to be a bit erratic for the next couple of weeks. So, to keep things ticking over until I get time to write it, here's an image from my next post. Any ideas? Deptford may have been the home of electricity generation, but earlier in the nineteenth century gas was the energy of the moment. By 1830, most public lighting in cities was gaslight, including Deptford's. The townspeople were obviously concerned to get the best lighting on the best terms, and to that end joined together with their Greenwich neighbours. That the Town of Deptford presents peculiar local facilities for the advantageous formation of a Gas Light Establishment. That the Improvements made in the Erection and Management of Gas Works, coupled with the great reduction in the cost of Materials, since the first introduction of Gas Light into this Neighbourhood, entitled the Inhabitants to a better supply at a more moderate rate, than they, at present, are enabled to obtain. That it is expedient that a Company be formed, for the purpose of more efficiently supplying the Towns of Deptford and Greenwich and their vicinities, with Gas Light of the purest kind, at the lowest price. That for this purpose a Capital be raised of £25,000 in 1000 Shares of £25, each. This document raises many questions about the supply of gas in Deptford - and the answers are by no means clear. The plans were certainly ambitious and would have required the passing of an Act of Parliament as well as the raising of the large amount of capital mentioned. It is perhaps unsurprising, then, that no company of that name appears to have been formed. It would have been all the more difficult since an existing gas company (if not two) already served Deptford. Pigot's Directory for 1840 lists the Gas, Light and Coke Company in Creek Street (now Creekside). They were presumably the company from whom the inhabitants could not obtain 'a more moderate rate'. Intriguingly, there are two candidate companies in existence at the time. The first was named simply the 'Gas, Light and Coke Company' which on the face of it is the best match for the listing. Based in Horseferry Road, Westminster they had been established in 1812 - the first such company in the country. At the time the residents met, the Company had works in Poplar, Brick Lane and Westminster. Among its innovations was the invention of the gas meter! In 1868, it would establish huge works in east London which it named for the company chairman Simon Adams Beck: Beckton. 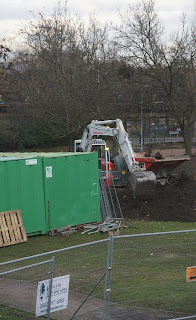 Despite the established competition, the idea of a Deptford gas works appears to have persisted for some time. Mary Mills, writing in the GLIAS newsletter for June 1999, was able to list a number of references to such projects in the local newspaper including, intriguingly, a grand dinner in 1844 to celebrate the Act of Parliament to allow Deptford to be lit by gas. Since 25 toasts are listed, we might imagine this project collapsed under the weight of the collective hangovers! In fact, the reason was more prosaic: discover how Deptford got gaslight here. Image: Goodwin's Court off St Martin's Lane, still lit by gaslight. 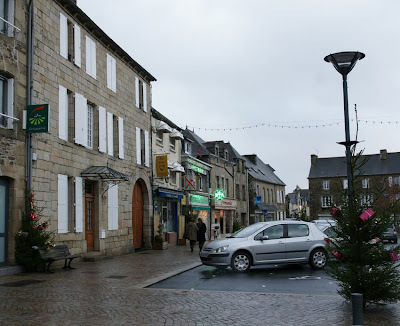 One of my favourite Christmas presents was a book by Pascal Lemercier which chronicles life in pays Gallo (the eastern, Gallo-speaking part of Brittany) and particularly the area in which my parents live. It's well-illustrated, including with old photographs and postcard images - and I couldn't resist taking comparison photos of some of the scenes today. 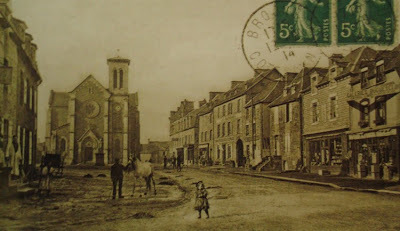 Here are two pictures of Broons, the local market town, in the early twentieth century. Below each is the same scene now. Among the major differences are the road surfaces and the presence of cars - but it's also striking that the church has gained a spire. Lady Somerset was born into the aristocracy and at the age of 22, married Lord Somerset. The marriage was unhappy and they legally separated. Although the failure of her marriage meant that she lost social position, it also enabled her to live an independent life financially supported by her extensive properties. She became a Methodist and devoted herself to philanthropy. Much of Lady Somerset's work was initially done among her own tenants in London. Following her father's death she also took over responsibility for his tenants in the village of Ledbury. Her work in improving living conditions convinced her that liquor was at the root of many social problems, and she not only took the pledge herself but also became active in the temperance movement. In 1890, she was elected President of the British Temperance Movement. For some years she worked and often lived with Frances Willard, a leading figure in the American temperance movement: they met at a US temperance convention in 1891. However, Frances's health was not good and she died in 1898. Thereafter, much of Lady Somerset's time was devoted to the Duxhurst Colony for Inebriate Women. This establishment accommodated around 40 women in village-like surroundings, and aimed to rehabilitate them. There was also a building housing dependent children of the women. (Many of the women chose to move to the colony as an alternative to a prison sentence.) Not long after her death in 1921, however, it became a home for poor gentlewomen and in 1936 was sold. None of the buildings now survive. Browsing through some old photos, I came across this fine postbox, a Liverpool 'special'. Now sat on Albert Dock, it was originally sited in Everton where it saw 115 years of service. It boasts an explanatory plaque below the collection times: these boxes were cast in 1863 and were specially sized to deal with areas of heavier post. Cochrane & Co, the Dudley company who cast this postbox, were doing a lot of similar work for the Post Office at this time. They also cast the hexagonal boxes designed by J W Penfold and used between 1866 and 1879. One of Ireland's oldest post boxes - cylindrical, with its slot on top - was a Cochrane. You can even see two of their cylindrical boxes of 1861 in Mauritius! This short paragraph from a newspaper of 1730 is not only evidence of the long-standing black presence in Deptford but also a tiny window into the complex connections between Britain and Jamaica. Last Saturday two Daughters of MAJOR Askew, formerly Deputy Governor of Jamaica, went to Deptford, in order to imbark there on board the Ship Mermaid for Jamaica, together with the four Blacks the said Gentleman brought over with him, who were lately Christen’d at St. George the Martyr; the Air of this Country not agreeing with the young Gentlewomen; not long since their Mother and another Daughter who came over from thence, died here. 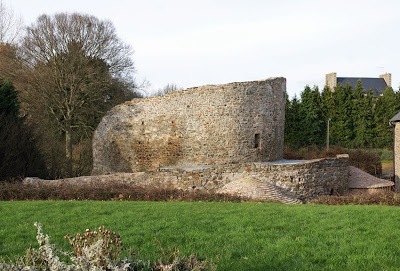 When Ireland's evangelising saints travelled to Brittany in the fifth century, they needed somewhere safe to moor their boats on its rocky shore. They chose Gwin Zegal, a sheltered spot near the town of Plouha where a little islet, accessible by land at high tide, provides protection. (A rock breakwater was added in the nineteenth century.) The name is a curious one, literally 'rye wine' but probably a corruption of 'wheat and rye' grown on the land above. In common with many other northern European harbours of the time, this one used trees for mooring posts. 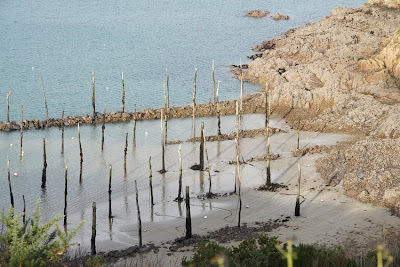 Their roots were 'planted' in the sand, with stones on top to help stabilise them; the weight of the wet sand did most to hold the posts in place. While most harbours have now adopted other methods of mooring boats, the trees of Gwin Zegal remain. 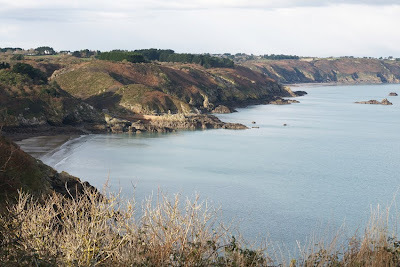 They are an extraordinary site, the more so as the harbour is at the base of Brittany's highest cliffs. 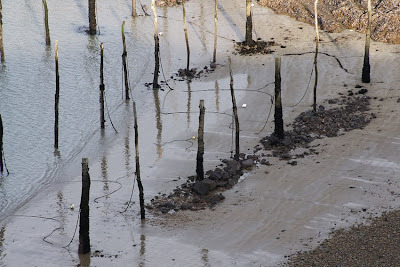 Although on a cold December day the moorings were empty, other photographs show boats still using the posts. It's a living piece of mediaeval maritime heritage. Further along the coast, these same cliffs played a part in more recent history. In the first eight months of 1944, local resistants from the Shelburn network helped 135 allied aviators shot down over France to escape to England. 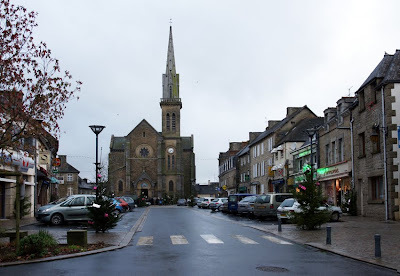 Many were hidden in houses in the commune before the signal came over the radio from London and they gathered in the home of the Gicquel family, the 'house of Alphonse', on suitable moonless nights. Resistants then led them across the dark countryside, strewn with mines, and down the steep cliffs by night; once the difficult descent to Bonaparte beach was completed the airmen were evacuated on a waiting ship. 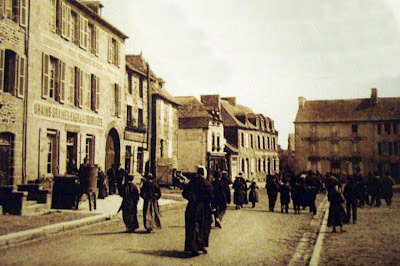 Eventually the Germans became suspicious and burned down the 'house of Alphonse', although the family were spared. 24 March was Ada Lovelace Day, celebrating women in technology. I featured Hertha Marks Ayrton, electrical engineer and suffragette. Story of London shone a spotlight on London's history; I enjoyed walks around the City and Deptford. Here's hoping it will be repeated in 2010. The Wilton's Music Hall open day combined an amazing building with delicious cakes - a definite winner! In April, Mary Wollstonecraft's 250th birthday was celebrated at Newington Green Unitarian Church. Another anniversary in May: 100 years of naval aviation saw HMS Illustrious visit Greenwich. 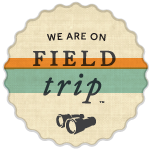 Thanks to Ian Visits, I made it on board! There were a variety of arts events: the mysterious Tunnel 228 saw me walking under Waterloo Station in a face mask. 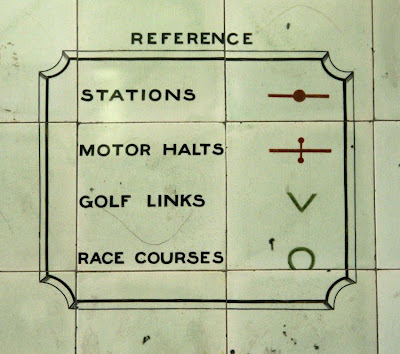 I was back underground for Chord in the Kingsway Tram Tunnel, where the venue was worth a visit in its own right. At Art in Action, I tried marquetry and wondered at the professionals. There was a rare opportunity to visit the London Fire Brigade Museum. The Thames Barrier's annual closure. A night at the circus, Edwardian style - thankfully without performing animals. Open House Weekend was, as ever, a real highlight: from a butcher's shop to the Lloyd's Building, not forgetting Lewisham's Palladian villa and St Paul's, Deptford. Finally, what would a Miscellany be without miscellanea? A complete witch bottle was found in Greenwich. The London to Brighton veteran car run offered an exceptional opportunity to see some of the very earliest automobiles. The Victorians had mail-order catalogues for most things, including churches. After a performance and an exhibition, I was addicted to magic lanterns - I now have my own! Moving from pre-cinema to cinema, amazing vintage films included 1920s London in colour and in black and white. Pathe's archive also went online, including Deptford footage. The Thames Discovery Programme introduced me to the foreshore at Custom House and Greenwich as well as Thames skulls. The Ghost Signs archive is now about to go live; here are some local favourites. My Postman's Park series reached a fitting, and poignant, conclusion with the new plaque to Leigh Pitt. With cold weather chaos back again, it's good to remember the scenic aspects of last year's snow. After a principled MP resigned in 1888, a controversial election followed - in which a joke fell flat. Carrington House: history of a building. The darker side of the town: thief-takers, prison hulks and the watch house. On the brighter side, one wrongdoer got his just desserts. The tragic story of a Tahitian’s visit to Deptford. Paynes Wharf, currently in development limbo. It’s a long way from the glory days of dockers’ perks and the Royal Victualling Yard with its astonishing wartime capacity. Albury Street - don’t miss the further information in the comments. Deptford Mechanics’ Institution: the magnificently-named Olinthus Gregory and a night of practical geometry. Colin Blythe, a great Deptford cricketer. There are old images of the town and plenty of information about Albury Street in Old Deptford History, while Bill Ellson also shares the town’s past at Deptford Misc. Deptford SE8ker has a good mixture of Deptford and London articles, A Room of One Zone shares various aspects of local life, and Transpontine includes information past and present on Deptford and New Cross. The best source for all things contemporary in SE8 is of course the Deptford Dame. 1. An unexpected bit of the Eiffel Tower. 2. A chimney in Nantes. 3. 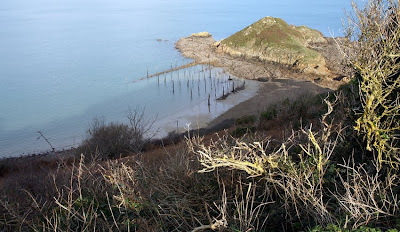 A lost harbour and a lost village in Somerset. 4. 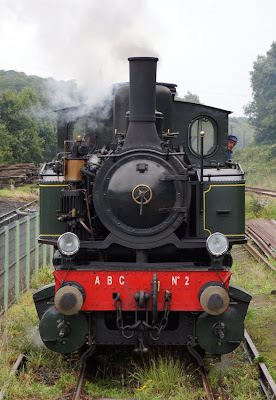 A steam train from Paimpol. 5. A Pugin masterpiece in Staffordshire. 6. A secret Victorian garden. 7. A public toilet in Great Yarmouth. 8. A stunning facade in Lille. 10. A taste of the past in Chichester. Want to read more? Explore two very different parts of France with Invisible Paris and Minnibeaniste. Enjoy England through English Buildings and Unmitigated England, or get Lost in Manchester.